Hey, look what I found on Oldham Street... it's a very interesting crop of new additions to the blogroll. Well the summer of sporting misery continues for the Great British Public! England are out of the world cup, Andy Murray is out of Wimbledon and England have been highly ineffective in the cricket. Sport is such a fickle beast, great one minute and terrible the next - If it's where your passion lies then you're in for a roller-coaster ride!! However, if you put your passion and energy into worshipping God then you will know a peace, joy and fulfilment that even England winning a penalty shoot out (will it ever happen?) couldn't provide. Moving on, I realise somewhat belatedly that I've neglected to add a great photo blog to the blogroll. I've written before praising Mr. Pretzels' blu-tack animation, but the guy also has a Manchester photo blog that is updated way more frequently, so I'm adding it to the roll instead. 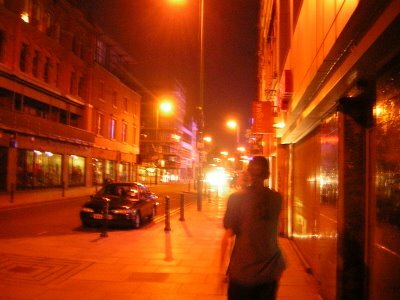 That's where the groovy orange picture of Oldham Street, late night, came from. Next up we have Img is Everything, written by Phil Thompson, who previously blogged at doubleonegative.com. He's a web developer who lives in Manchester, and it mostly deals with web developer stuff that I can't really understand, but I know some of you geeks will benefit from it's tips n' tricks. In fact, the img part of the blog's title is written in html, so that if you try to include it in a post it actually creates a little text box... clever, but it kind of makes it hard to blog about the site without changing the name.